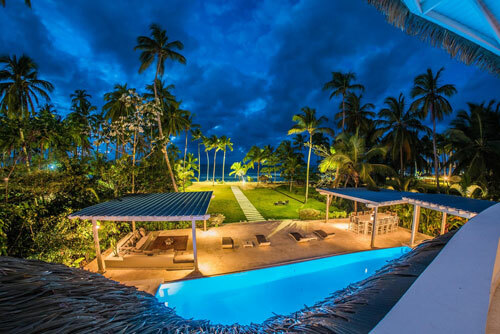 This luxury villa is located right on the exclusive Cosón beach. 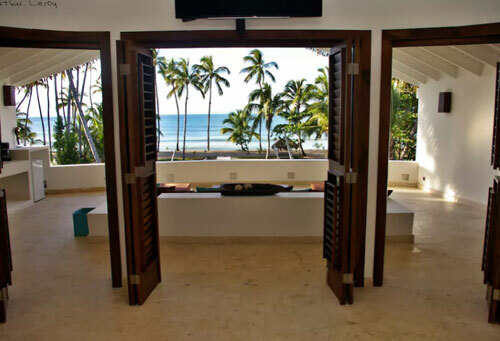 With With 1,000 sqm / 10,750 Sq ft of built area and 11 bedrooms, it is one of the largest beachfront villa on the North Coast of the Dominican Republic. Everything was carefully designed to take advantage of the breathtaking view of the ocean and always remind you that you are on vacation. Built with many open spaces and covered terraces and lounges, a modernly furnished living room and a fully equipped gourmet kitchen. 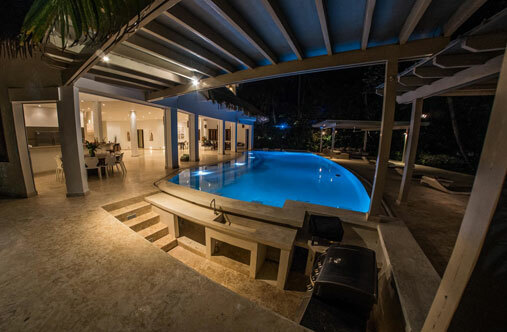 The villa offers huge open spaces and terraces, an infinity pool with jacuzzi and bar, a workout and billiard room, wifi, air conditioning and more. The main house has 10 bedrooms : 5 bedrooms downstairs and 5 bedrooms upstairs: The five bedrooms downstairs are very similar, each with its own bathroom, one king-size bed (except one room with two twin-size beds and one with a queen size bed), fan, A/C but without sea view. 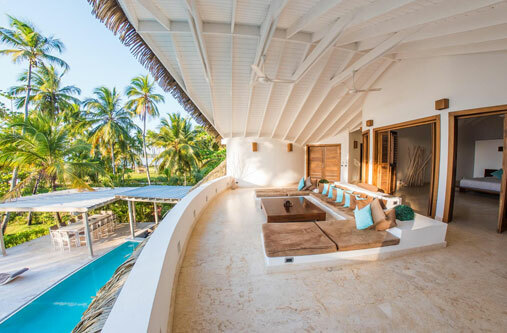 One of the five bedrooms upstairs is the master bedroom with terrace overseeing the bay, a bathroom, one king-size bed, a fan and A/C and flat screen TV. There are two more bedrooms on the terrace with ocean view, each with 2 twin beds, their own bathroom, fans and A/C. Then there are 2 bedrooms of similar comfort in the back of the house without no sea view. They both have one king-size bed, fan, A/C and their own bathroom. There is one extra smaller bedroom next to the laundry with 1 queen size bed, bathroom, fan and A/C.